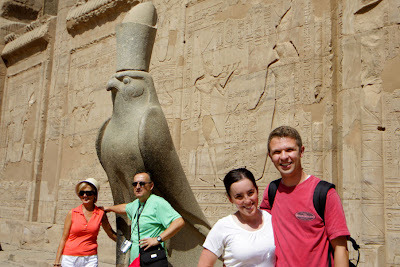 We started the day by touring the Temple of Horus in the city Edfu. 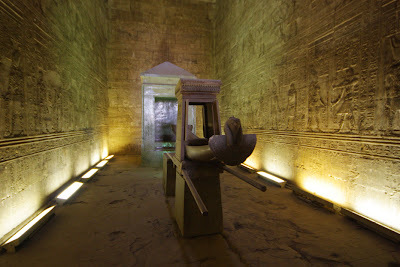 Amazingly, this temple was covered in sand for thousands of years and wasn't discovered until the 1860's. It's shocking to think that something this large could be lost for that amount of time. Fortunately, this helped to preserve the temple. Many of the ceilings were either still in place, or were easily repaired. This made it easy to image how the temple originally looked. This is the Holy of Holies. 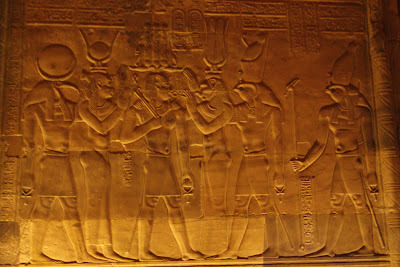 It was the center of the temple and was where the people came to worship. The shrine is a reproduction, but it was neat to see how it looked in the temple. The falcon statue is original and is in perfect condition. The detail in it is amazing. This wall is one of the highest surviving pylons and stands about 125 feet high. 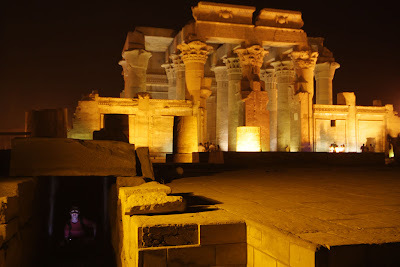 In the evening, we went to the Temple of Kom Ombo. 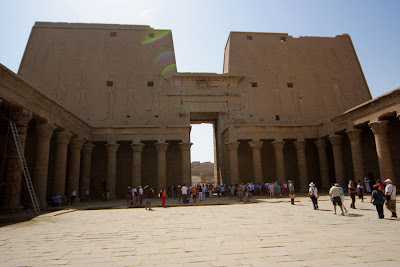 It is unusual in that it is a double temple that is dedicated to two gods with two Holy of Holies side by side. 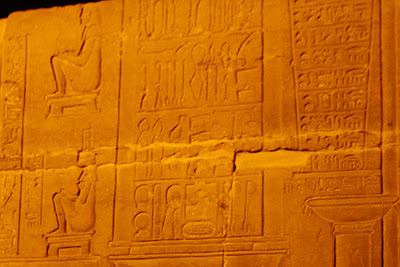 This hieroglyph is of the various medical instruments that the Egyptians used. 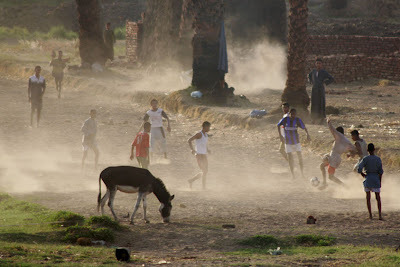 Some of them are still used today. The two figures on the left are on birthing chairs. For thousands of year it was traditional for women to give birth in chairs like these. 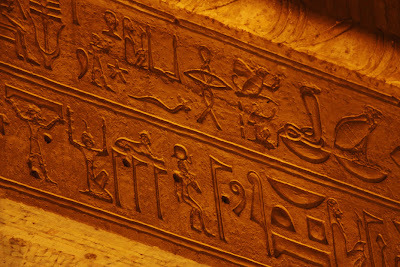 This is considered the best hieroglyph in Egypt. The detail in the figures is incredible. Every muscle and detail is perfect. 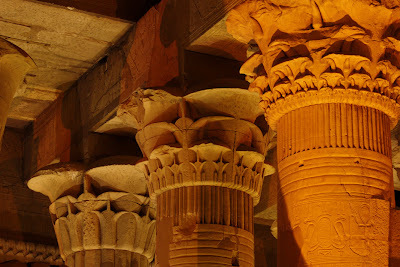 It's fascinating that the detail in the columns has remained for so many years. I just like this picture. 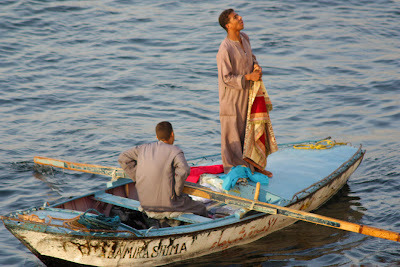 We started the day early with some tours of the West Bank of the Nile near Luxor. The statue above is one of two that used to guard a giant temple. 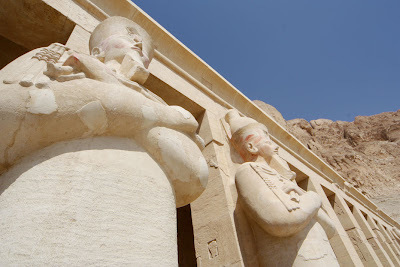 The temple has long since been demolished, but the statues are quite impressive. 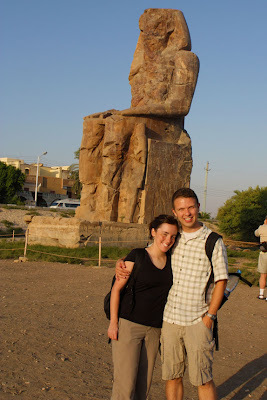 We went to the Valley of the Queens and the Valley of the Kings. 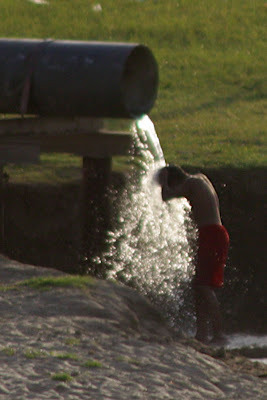 Both locations do not allow any cameras, so these photos were downloaded from the Internet. 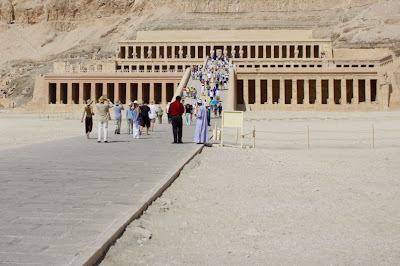 Both sites are where the Queens and Kings (Pharaohs) of ancient Egypt were secretly entombed with all of their treasures. 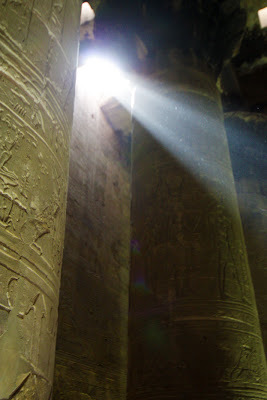 Unfortunately, the secret got out and all but one of the tombs were pillaged thousands of years ago. 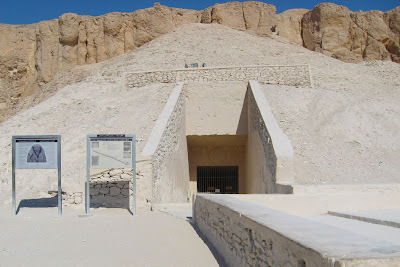 King Tut's tomb is the only one to be discovered untouched in the modern day. 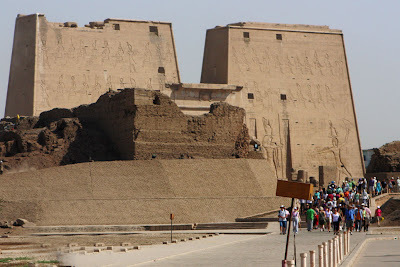 The more important Pharaohs had large corridors leading to the tombs. 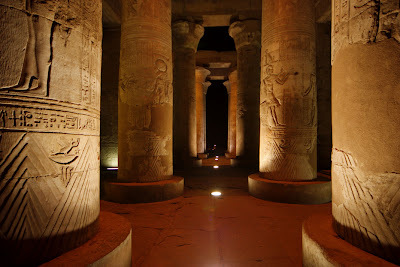 In some tombs, like Ramses IV, the corridor was over 200 feet long and covered with detailed, colorful, hieroglyphs. 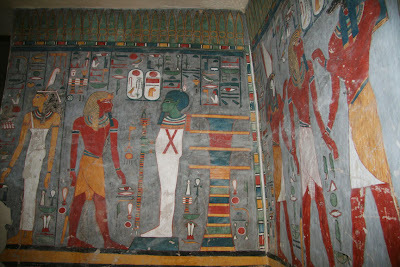 Around the tomb, the hieroglyphs still hold the vibrant colors from several thousand years ago. It was breathtaking to see. 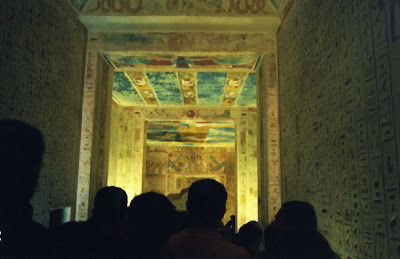 We also went inside King Tut's tomb and saw his body. It was fascinating to see the relatively small tomb he was buried in since he died unexpectedly at the age of 19. 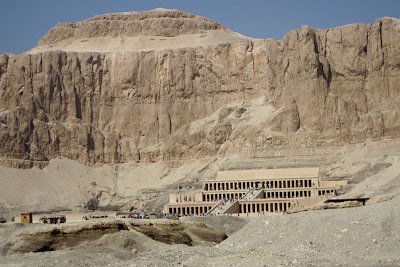 Next, we went to Queen Hatshepsut's temple. This temple has been heavily restored to the way it would have looked during her time. About 25% of it is original. Regardless, it is very impressive. Giant statues line the temple. This is the view from our room in the cruise boat. 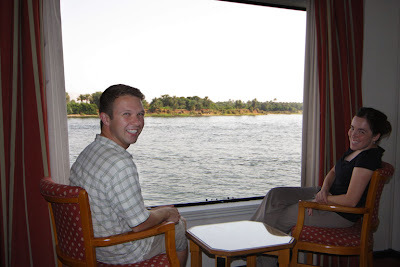 It was fascinating to watch what was happening along the Nile from the view in our room or from the pool on the roof of the boat. 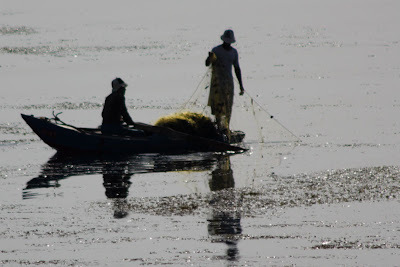 Small boat fishing is very common to see along the Nile. 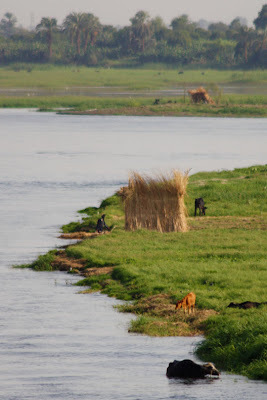 We felt like we were floating through a National Geographic magazine as we saw cows swimming along the Nile. 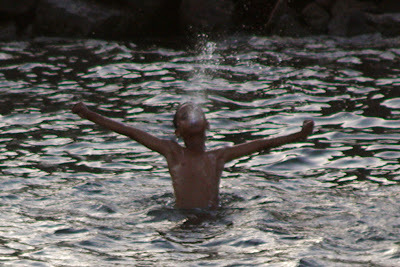 We found many kids happily playing in the water. We spotted this great shot from the top of our boat. The small boats that seem to be attacking the river boat are actually trying to sell souvenirs to the tourists on the boats. 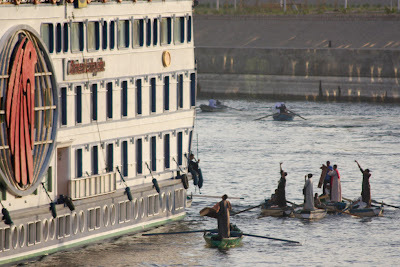 They would line up along the side of the boat and yell out to the tourists on the top deck. 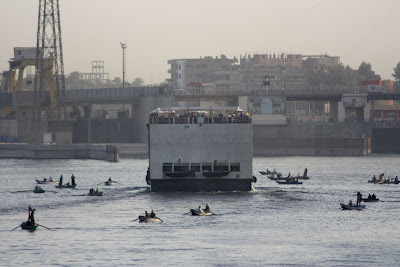 If someone was interested in buying, the men would throw the item all the way to the top of the boat. Then, the tourist would place the money in a sack and throw it down to the men.